Before I begin, let me just announce that this is my 100th post! 🙂 To everyone following my blog, thank you so much for reading and leaving comments. I hope to keep things interesting and I look forward to the 200th blog post! Can you believe it’s 34 more days until Christmas? I still have not made my Christmas list. Mentally, I have, but with the way I keep on misplacing my phone and keys, it does not amount to much. 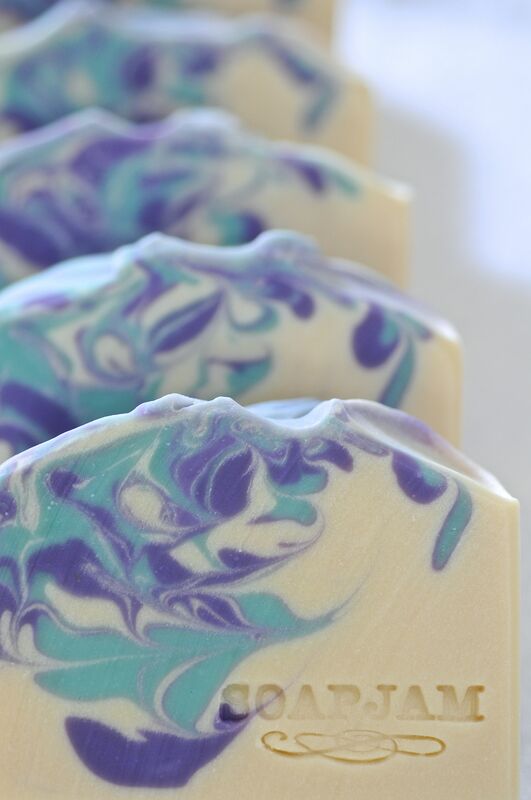 This year though, I was early with my Christmas soaps in anticipation of my trip to Japan at the end of October – where I met up with Tokyo-based Maya, the creator of Infusion‘s ethereal soaps. 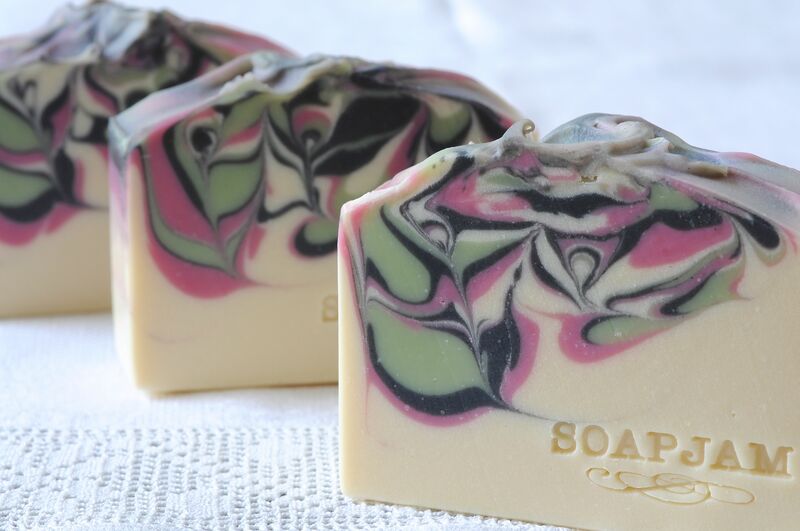 Back to soap, the ones I made in September are mostly gone. 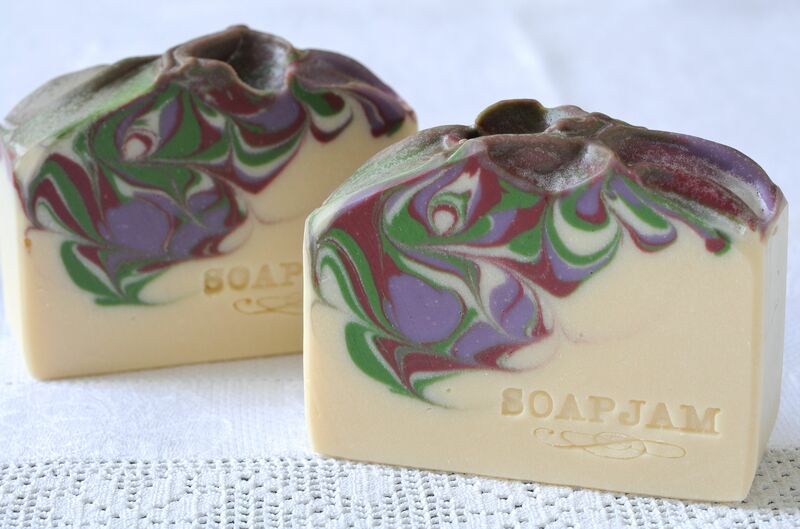 I have been busily making new soaps and remaking favourites since I came back from my trip. 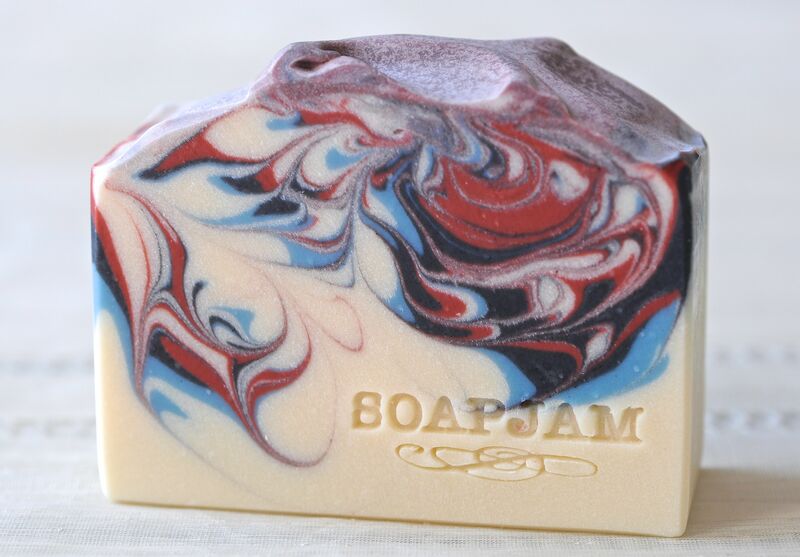 Last year I only had 2 holiday-themed soaps, but this year, I have been bitten by the Christmas soap bug. You may find here the first set that I made, and here’s another one…. 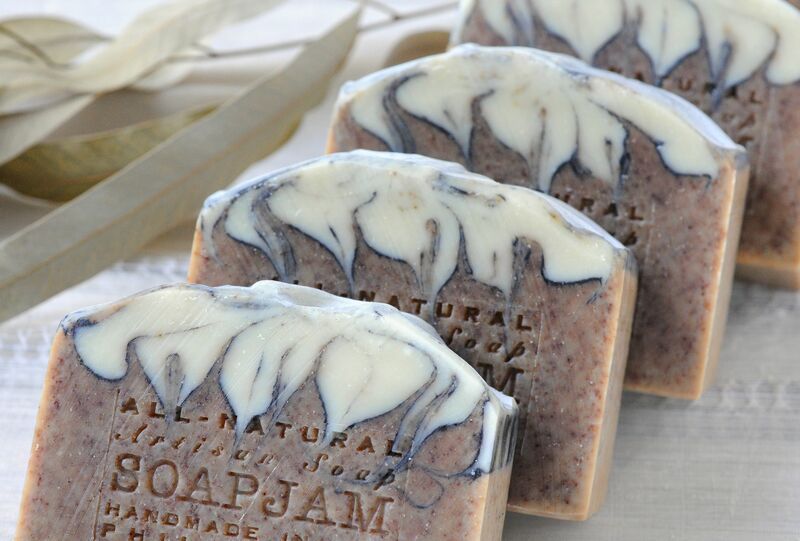 A warm and rich blend of juicy mandarin, frankincense, myrrh, sandalwood and spices. 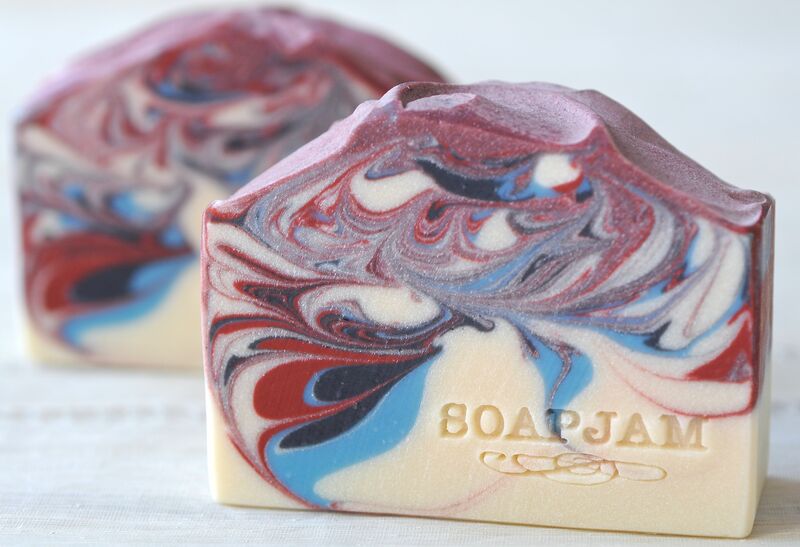 The colors are inspired by the beloved Christmastime ballet performance, The Nutcracker. I made 4 batches and they all have different colour intensities and patterns. 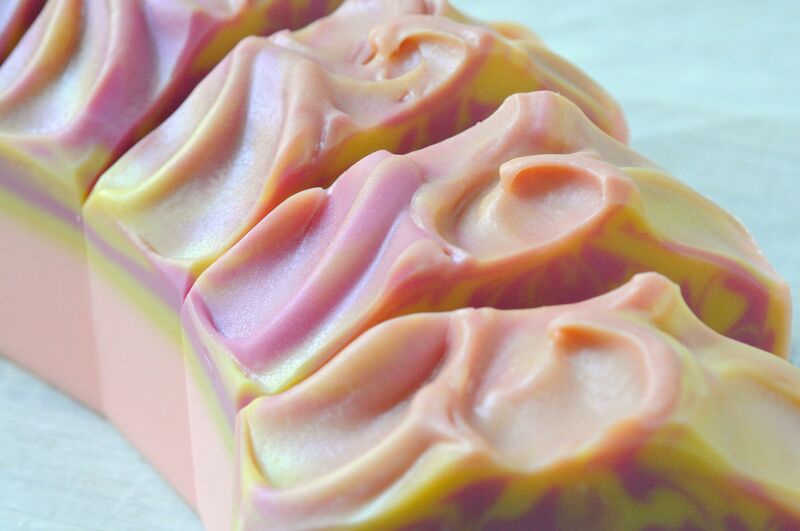 For some batches, I poured the coloured portions on one side only, and for the others, I poured in the middle. Which do you prefer? 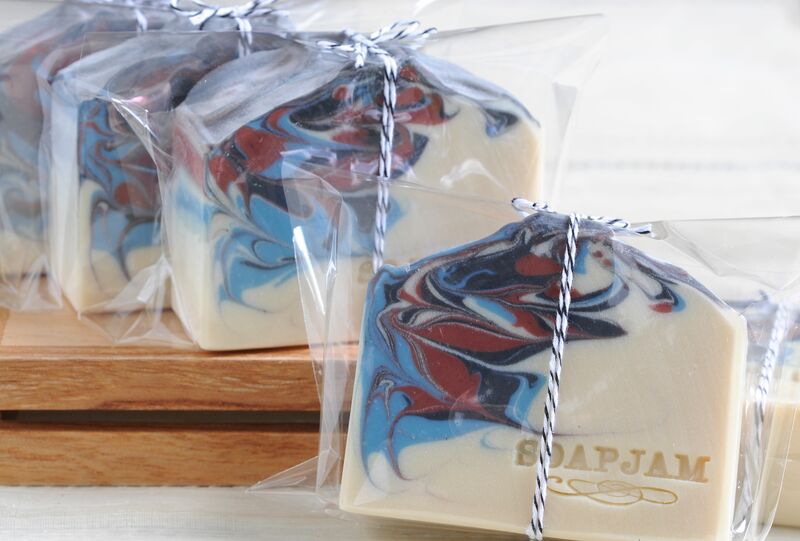 This entry was posted in Cold Process, Perfumed Soap and tagged christmas soaps, Hanger Swirl, holiday soaps on November 20, 2014 by soapjam. Zahida Map is undeniably the queen of butterfly hanger swirls. She has inspired me to try her technique of moving the hanger not just up and down, but sideways and round about too. Because of her, I am more hooked than ever on the hanger swirl. 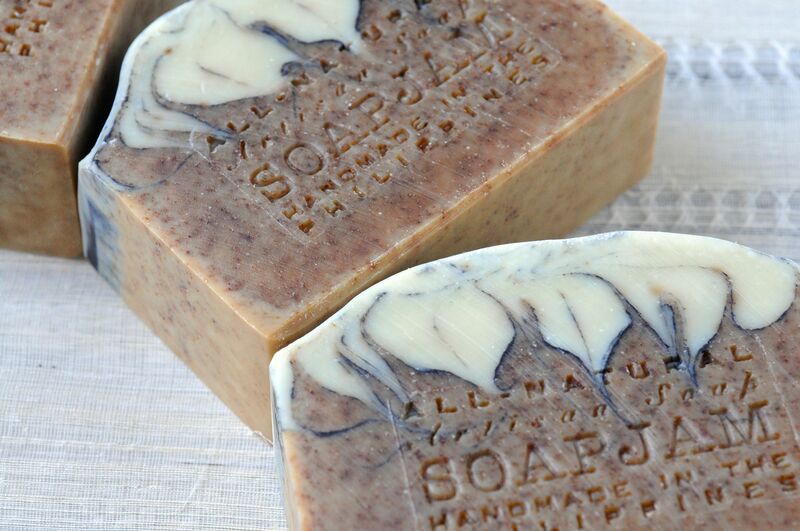 There is an element of thrill in that you never know what you’re going to get until you cut the soap. 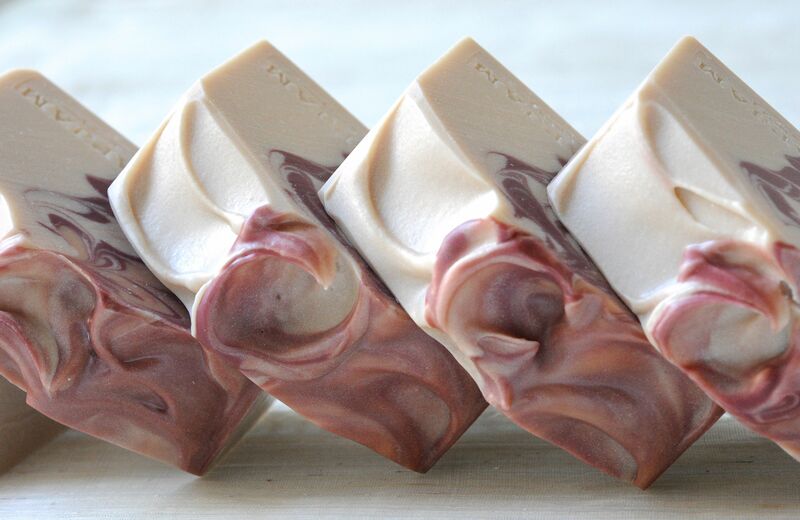 For this technique to work, the soap batter has to be just the perfect consistency. Too thin and the swirls won’t look well-defined; too thick and the swirls won’t look fluid and there will most likely be air pockets. 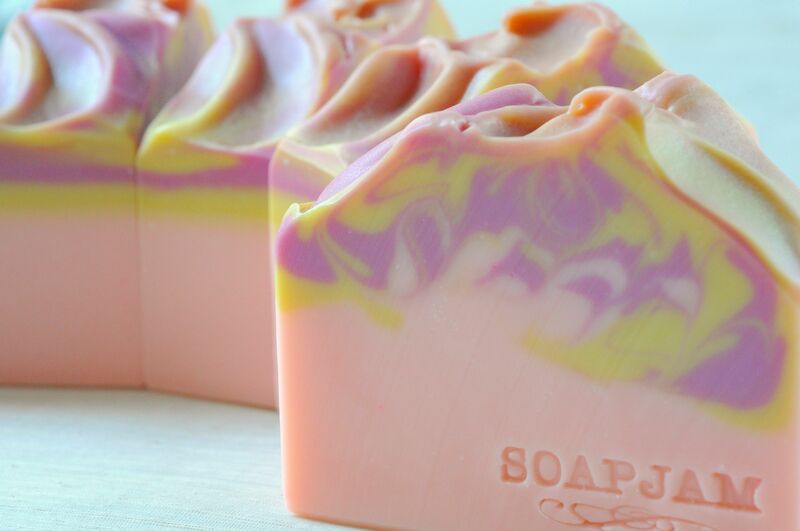 Earlier this year I made soap called Puppy Love – scented with neroli and grapefruit. 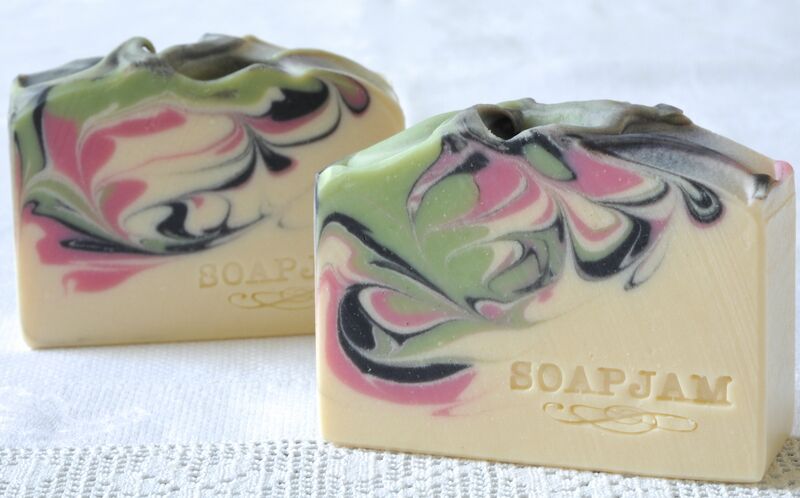 I am partial to both neroli/orange blossom and citrus scents for their fresh and uplifting quality. 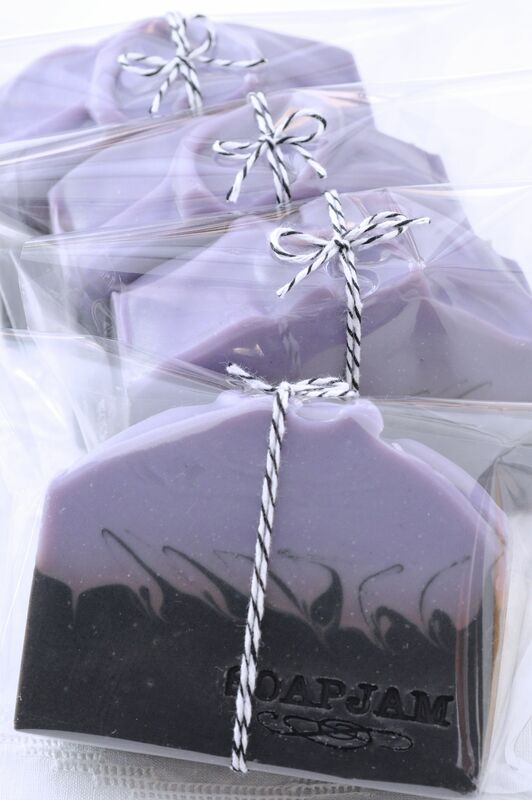 They are also imprinted in my olfactory memory – bringing me back to childhood scents that I’ve never grown tired of. I made 4 batches and I love the way all of them turned out. The photos below are from different batches. 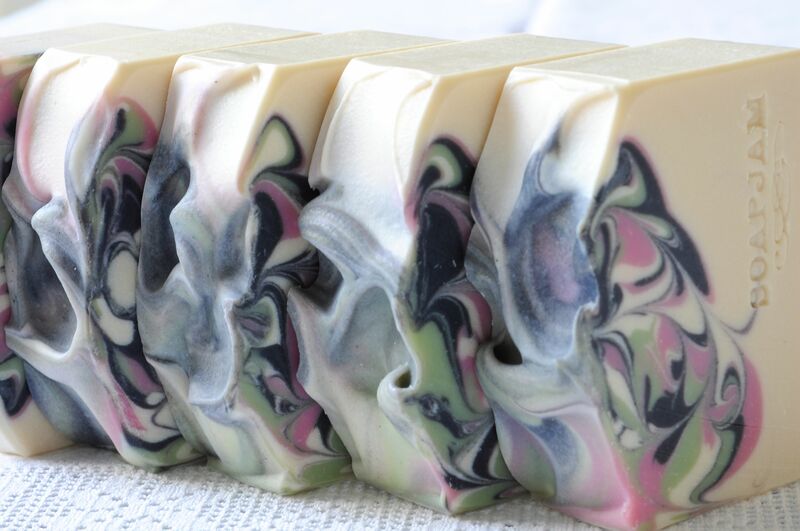 This entry was posted in Cold Process, Perfumed Soap and tagged Hanger Swirl, Neroli Soap, Tivoli Soap on October 17, 2014 by soapjam. 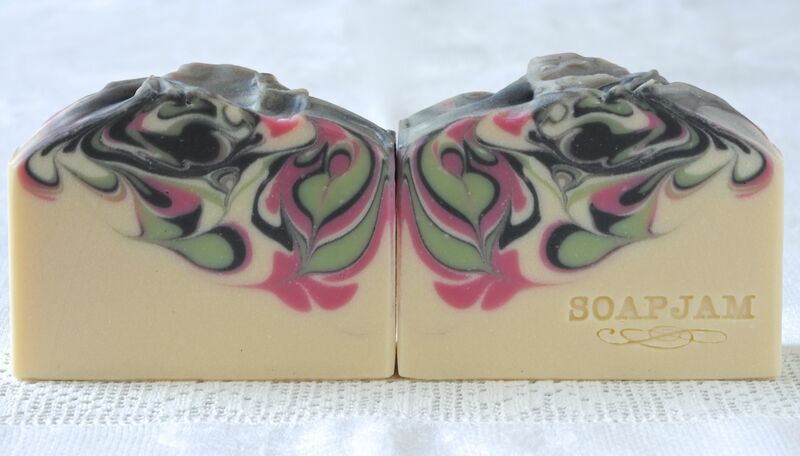 I love the way the swirls came out on this one, and I just loooove the way it smells! Finally a pungent ginger that really pops without too much of the earthiness. 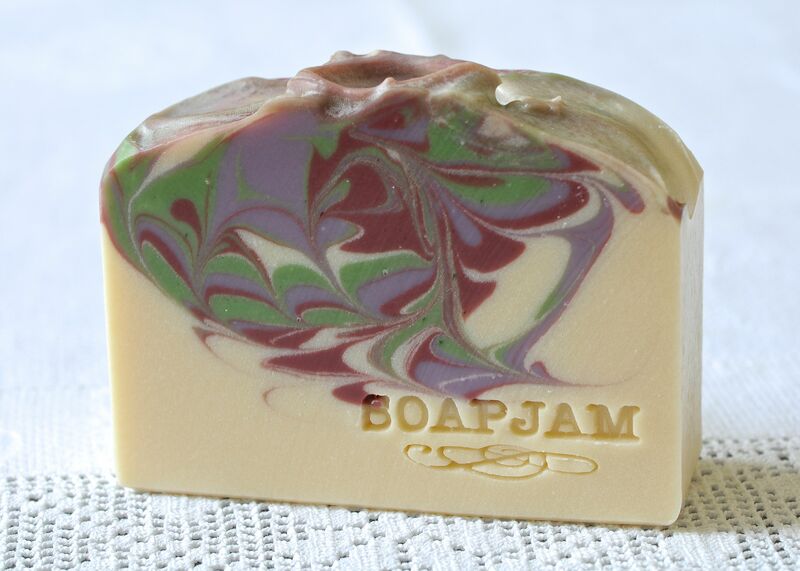 It reminds me of ginger ale with just a bit of fruity and honey sweetness. I find the scent comforting and I think it would be a great blender, too. That said, the scents that I find fantastic are not necessarily the most popular, and conversely, scents that are popular are sometimes not my type. Where do you find yourself? Does your taste run similar to your customers’? 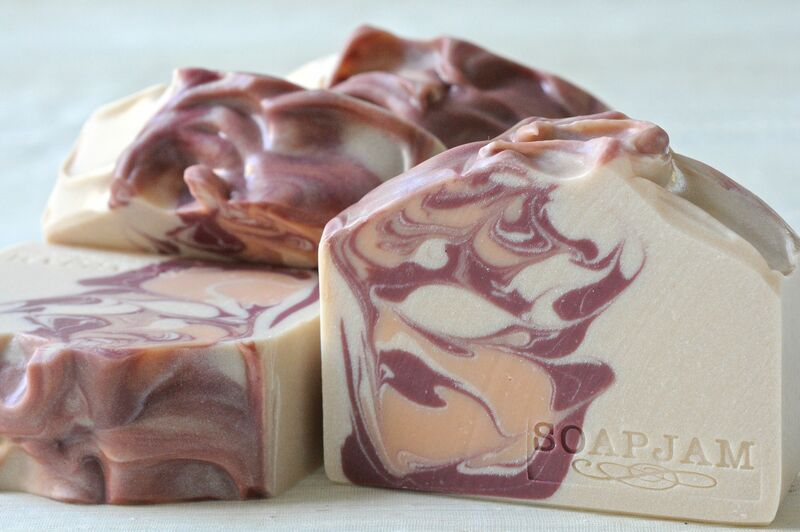 For the swirls, I used a scant 1/4 tsp burgundy oxide for 400 grams of soap, and 1 tsp (sample size) of peach sunset mica for the same amount of soap. 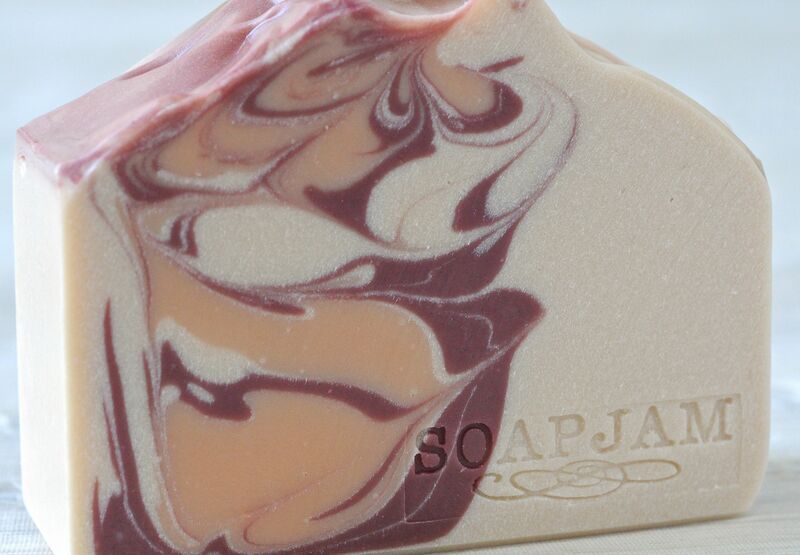 This entry was posted in Cold Process, Perfumed Soap and tagged Cold Process Soap, Ginger Persimmon Soap, Hanger Swirl on August 13, 2014 by soapjam. When I like something, I tend to keep on repeating it. That’s the way I listen to music – looping the same set of songs over and over again. I may not be sick of it yet, but others unfortunate enough to hear my music for the nth time are bound to complain! 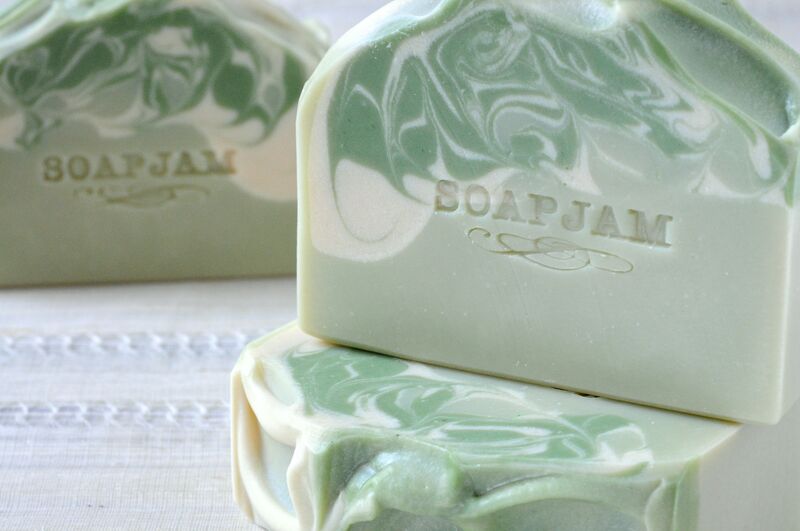 😀 It’s no different with my soap making, but I hope no one is about to complain! Since acquiring a wire hanger, I’ve been swirling away with it whenever I could. In my previous post, I used micas, oxides and ultramarines for the swirls. 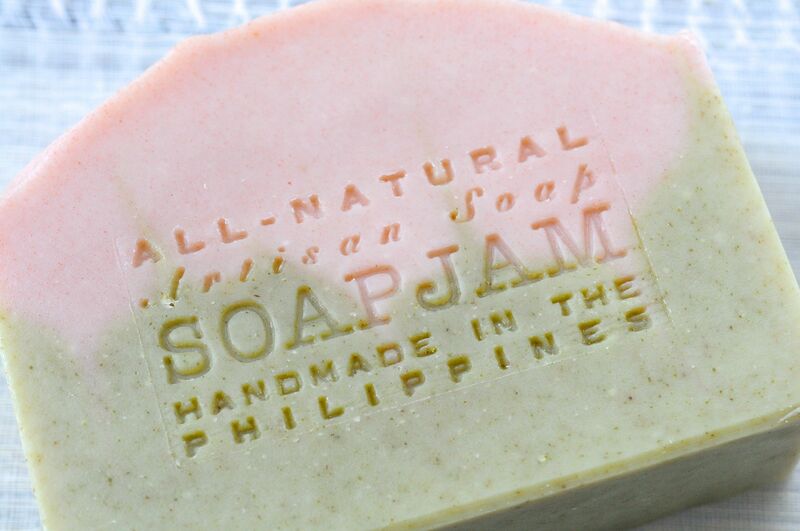 Here, I used all natural colorants. 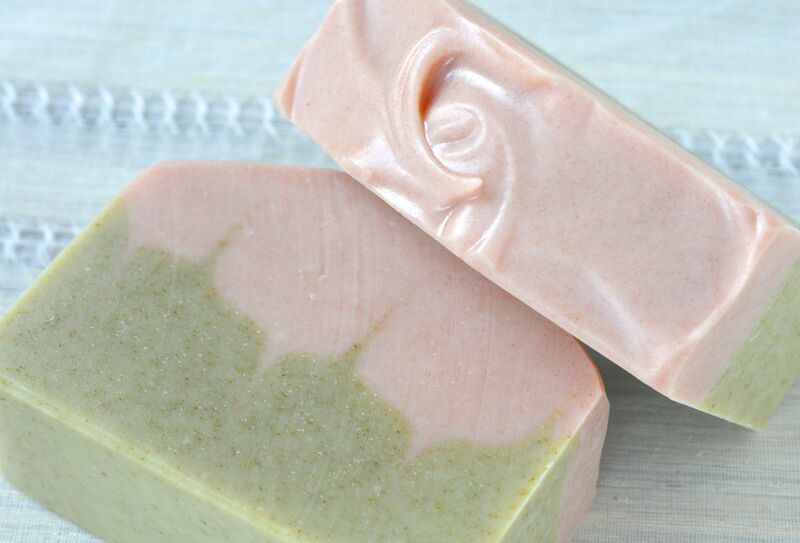 I used 1 Tbsp (8 grams) French Pink Clay mixed with 10 grams of water for 750 grams of carrier oils to get a nice pastel pink colour. 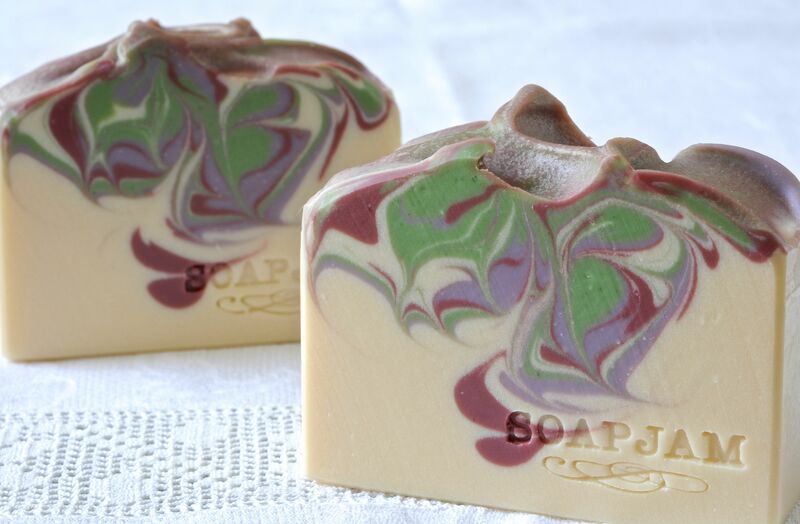 In a previous moringa soap I made, I strained out the moringa powder and used only the infused oil. It yielded a lovely avocado green colour but it started to fade after 6-7 weeks. Here, I included the powder that has been saturated in oil for a month. I am sure it will fade eventually, but I think it will stay longer than the one with the infused oil only. 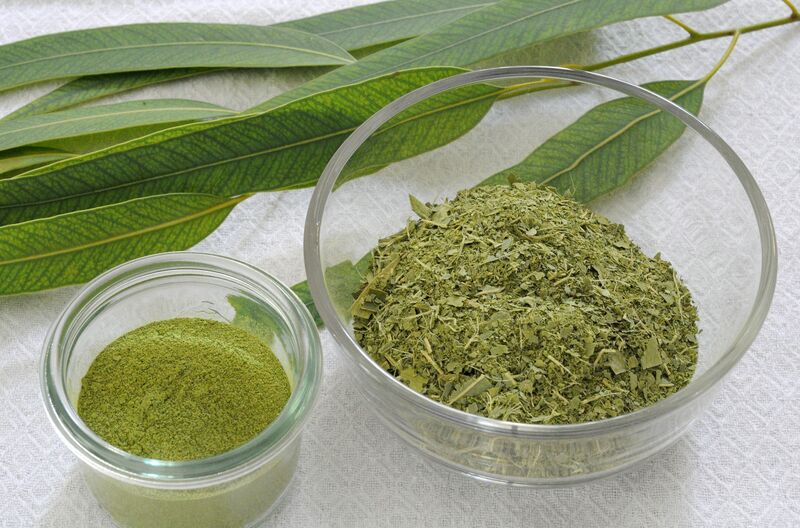 The moringa powder provides mild exfoliation while the upper pink part provides a slippery contrast. 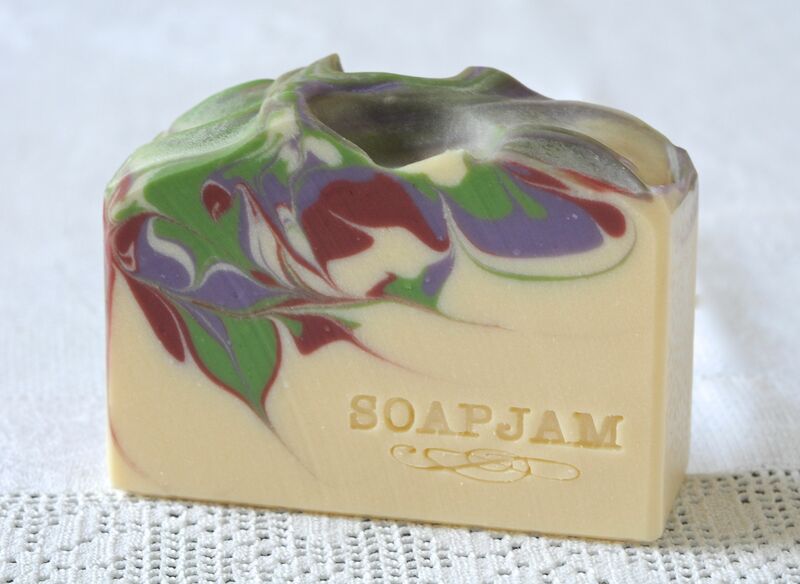 It is scented with lavender, peppermint and eucalyptus E.O.s. A while back, I made my own dried botanicals and infused them in oil. 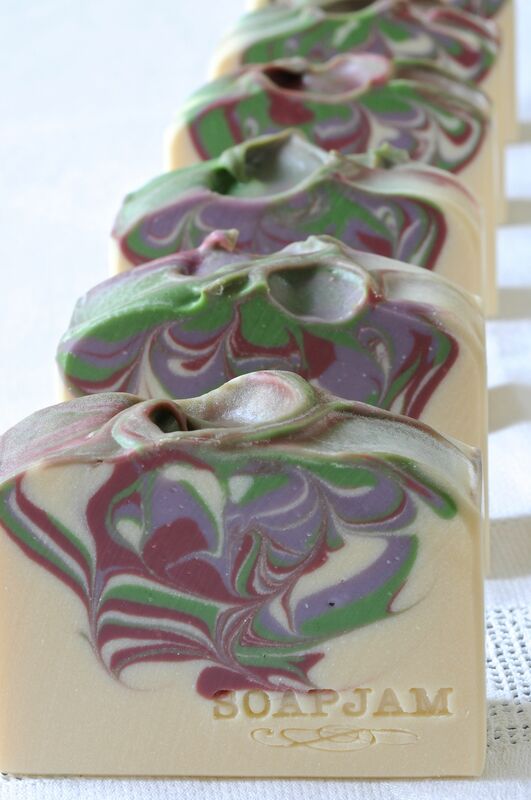 The eucalyptus powder made a green oil infusion, but when I soaped with it, it instantly turned tan, and upon unmolding, it had turned brown. 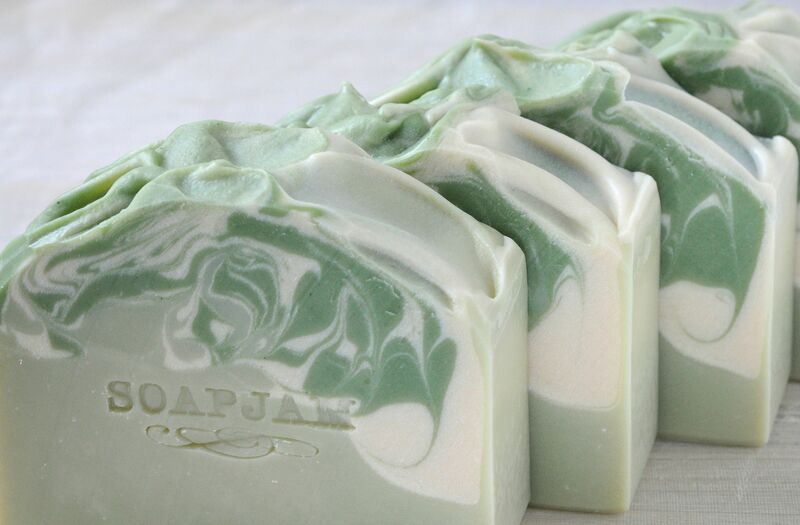 There was no gradual discolouration like most natural green colorants. My original plan was to do a charcoal pencil line The batter was pretty thin and as I was adding the top layer, I knew I was not going to achieve a straight line. I ditched my original plan and went for my hanger. I am glad of the change of plans because I love the way this came out! 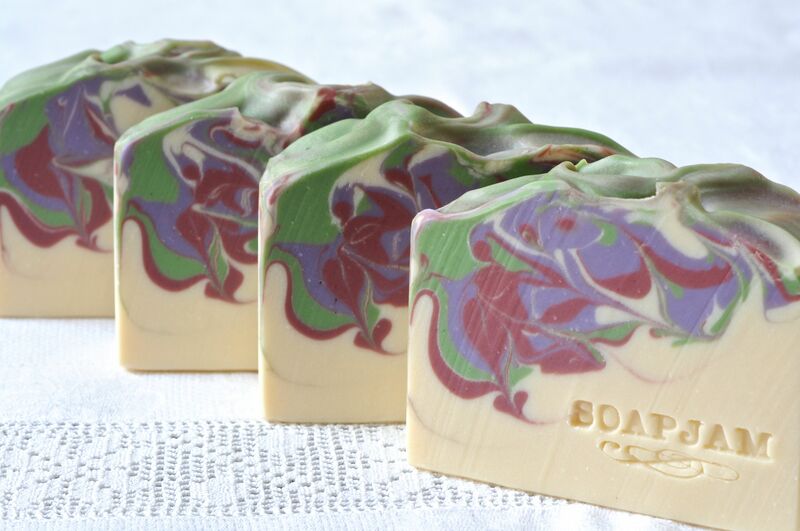 Aside from the oil infusion and eucalyptus powder, it is also scented with eucalyptus and grapefruit E.O.s. 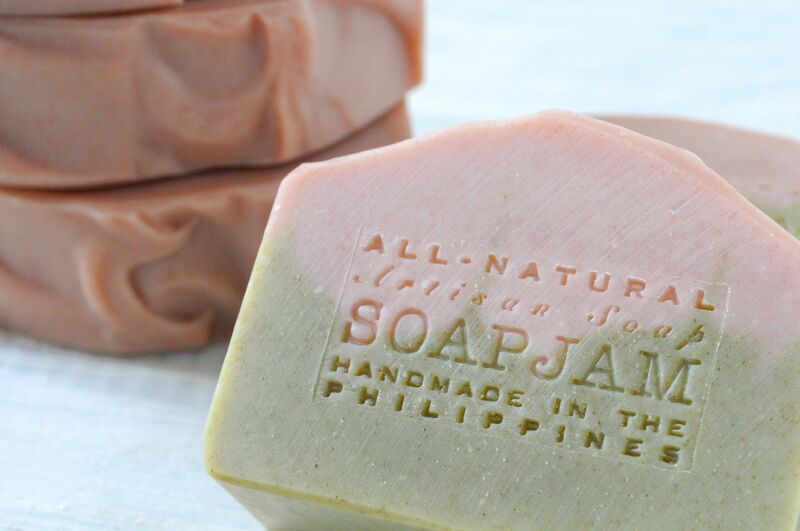 This entry was posted in All-Natural, Cold Process and tagged dried botanicals in soap, Eucalyptus Soap, Hanger Swirl, moringa soap, natural colorants in soap, Pink Clay Soap on August 10, 2014 by soapjam. 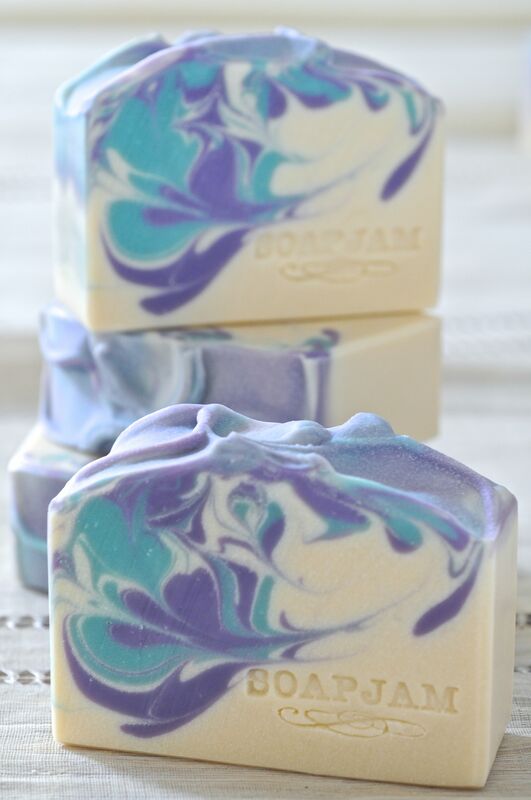 The Hanger Swirl is such a popular technique but can you believe that it’s just now, after more than a year of soaping, that I am doing it? 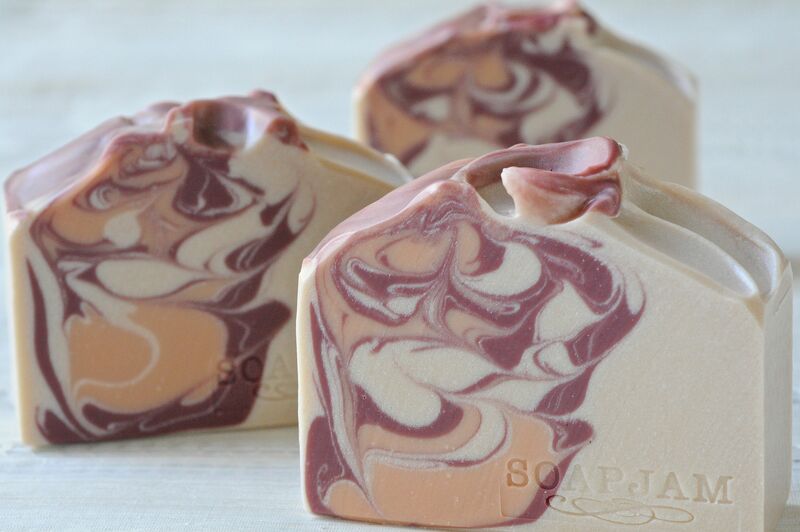 I’ve been admiring hanger swirl soaps, but for the longest time, I could not find a wire hanger! I finally did a few months ago but it was children-sized and I could not take it apart to make it longer. 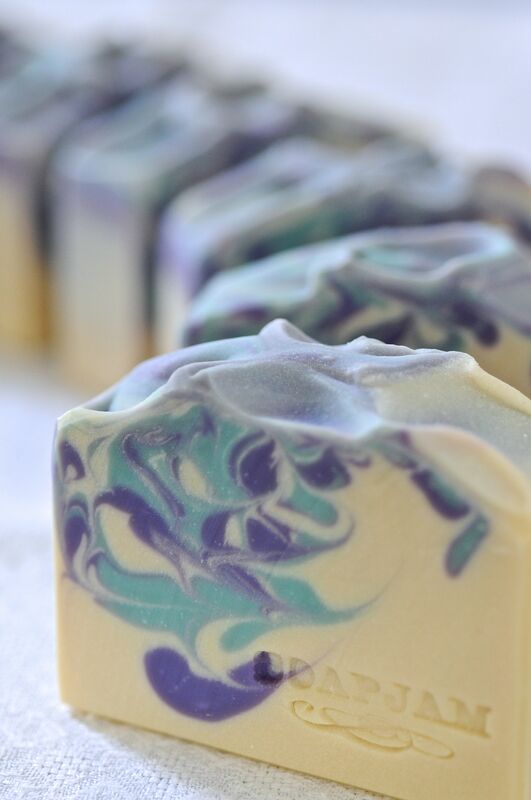 Black Amber and Lavender – my first hanger swirl. 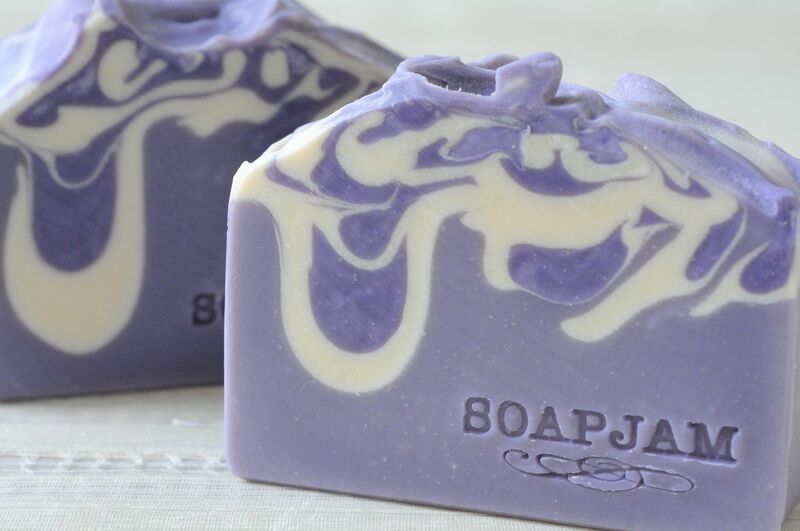 I have been soaping quite a bit I don’t even remember if I used a hanger on this purple soap. I thought I did, but looking at it now, I think I did not. 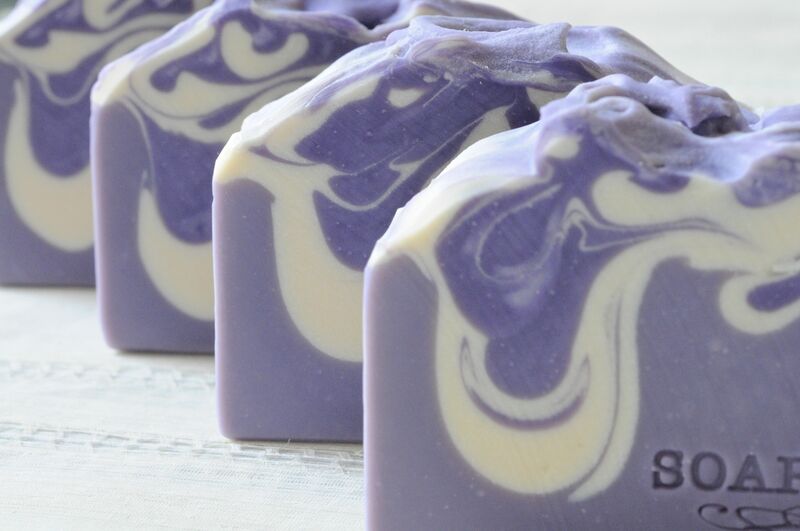 The oddest thing happened with the above Lavender Honeysuckle soap. 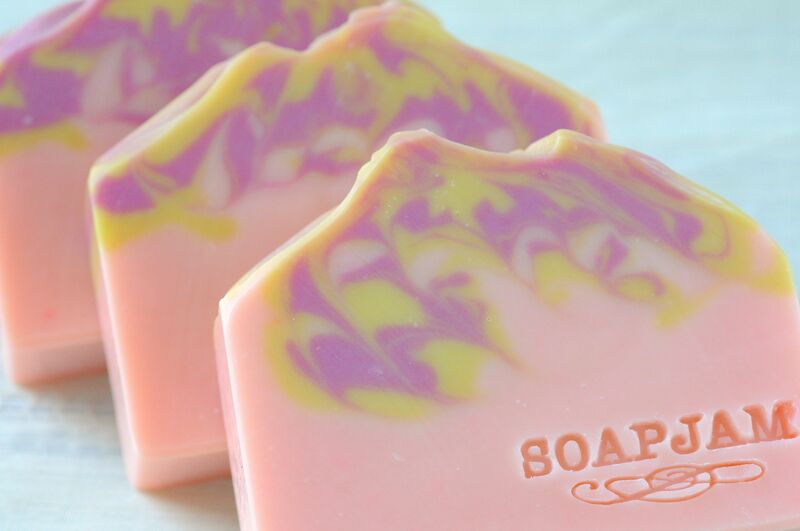 When I added the fragrance to the pink portion (coloured with pink lemonade mica), it instantly turned violet. 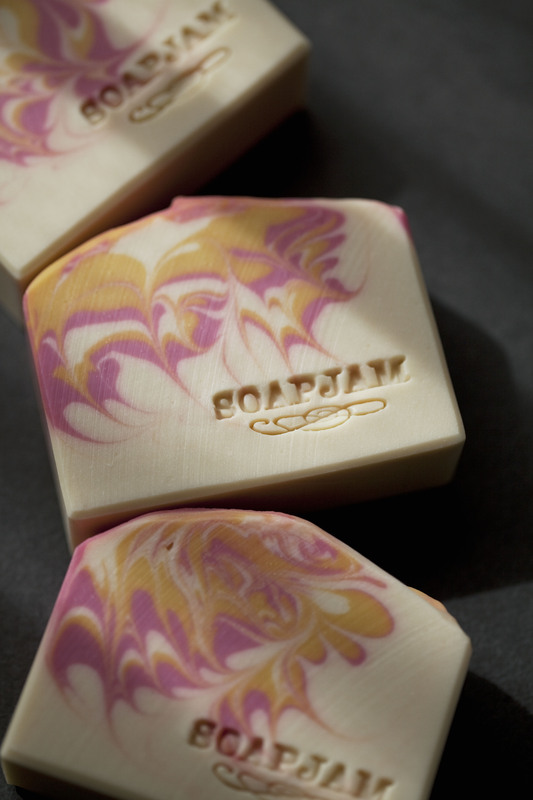 When I unmolded the soap, it had returned to pink. Has anyone experienced this? 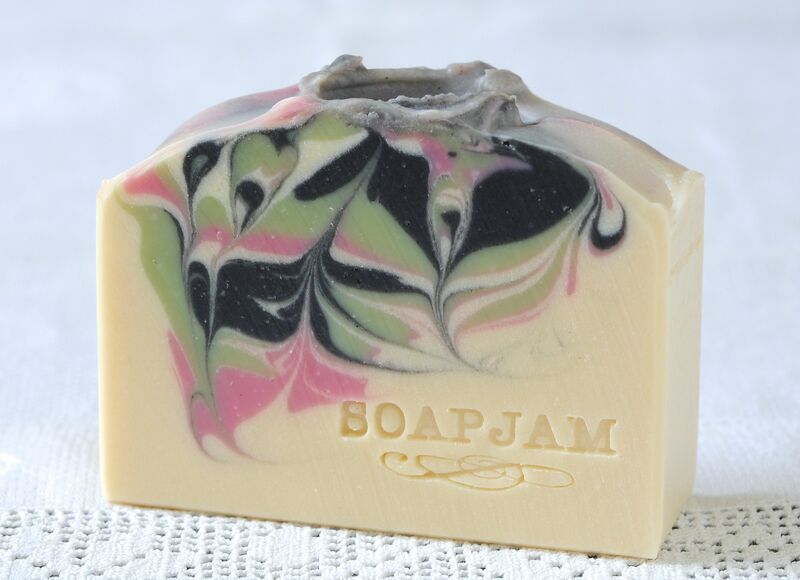 This entry was posted in Cold Process, Perfumed Soap and tagged Hanger Swirl on August 3, 2014 by soapjam.